The fourth book by the bestselling author – previously authored You are the Best Wife, Her Last Wish, You are the Best Friend. Ranked bestseller #1 in Indian Literature in just 24hrs of going on pre-order on Amazon India. After having sold more than a lakh copies of his books, A Girl to Remember was welcomed by readers with great expectations. ‘A Girl to Remember’ a book by an IT professional and travel enthusiast turned bestselling author Ajay K Pandey was released at Sapna Book House at Residency Road in Bangalore. The book was unveiled by the author and Mr Arup Bose, Publisher, Srishti Publishers & Distributors in the presence of a huge gathering of fans and readers. ‘A Girl to Remember’ is a roller coaster of emotions and explores relationships from the perspective of a teenager, a young man, and a widow quite older to him. In a country where social taboos and social image change the course of lives, Ajay’s book makes the reader stop and think of where we need to change. A story of love at its very core, it’s an electrifying read that shows us how confession can be the best punishment. It also explores passionate romance, loss, and infatuation in a polished narrative that leaves you asking for more. The characters are lovable, hatable and even relatable, but most of all – they are one among us, and a truly thrilling read. 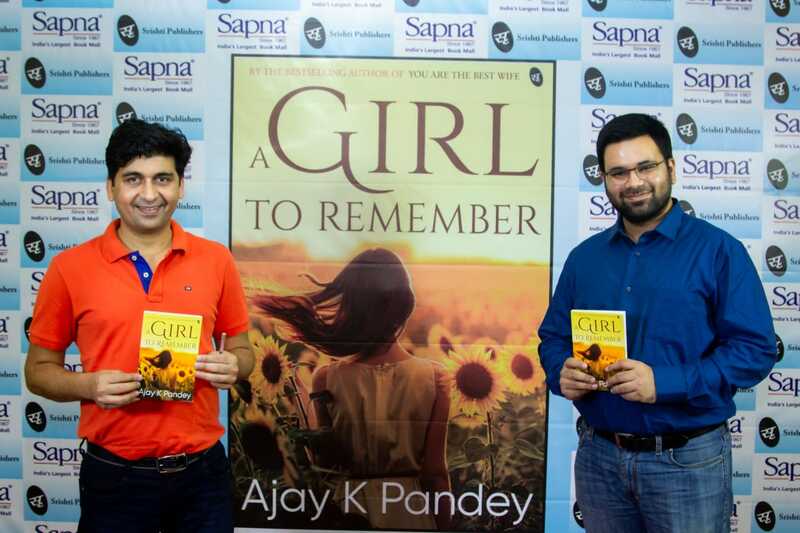 ‘A Girl to Remember’ will be available at all leading book stores across the country. Interested readers can also order their copies on amazon at a special price - https://www.amazon.in/Girl-Remember-Ajay-K-Pandey/dp/9387022390. Interestingly, Ajay Pandey’s ‘A Girl to Remember’ was ranked #1 in Indian Literature within a day of opening of pre-orders, reflecting the among all books available on Amazon.in. The book has maintained a consistent position on all leading online portals ever since. “I have been getting messages from the readers about how the story has made them laugh, cry and smile all the way. It’s a delight to know that people are liking this rare story that tells us how faith works wonders. This book is very different from the previous books I have written, and I hope more and more readers like it. Plus, working with Srishti again has been a great experience,” said Ajay Pandey. Ajay’s first book You are the Best Wife was published by Srishti Publishers in 2015, and went on to become a bestseller. It was based on his real life story and made it straight to the hearts of his readers. One of the rare titles to retain 4.5 stars after close to three thousand reviews, Ajay’s stories have continued to charm his readers. His second book Her Last Wish only expanded the fan base and made his place in the bestseller list unmovable. Charmed by his writing style and sensitive treatment of stories, his readers have applauded his next You are the Best Friend and are eagerly awaiting the next one. Ajay is fond of travelling, trekking, and teaching, and is deeply associated with various social work organizations. He makes it a point to individually connect with and respond to all his readers, making him a personal favourite for many, and introducing several others to the world of reading too.